Tristan Government Representative talks to sixth formers. Prince Philip's school, Gordonstoun in Scotland, was the setting on September 15 as Tristan’s UK Representative Chris Carnegy gave a lecture to over 100 sixth form students. Taking as his theme 'Did a Scotsman create Utopia? ', Chris explored the idealistic founding principles of William Glass of Kelso who created the island community in 1817 as a co-operative venture with all 'equal in every respect'. Chris also traced some island history, including the 1957 visit by the Duke of Edinburgh who was a pupil at Gordonstoun. 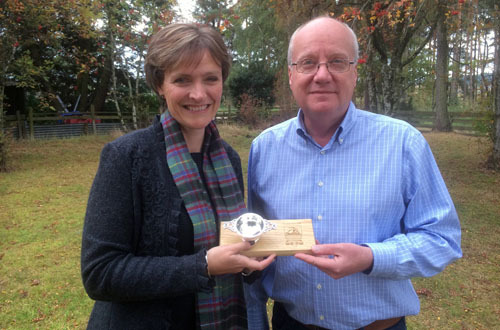 School Principal Lisa Kerr with Chris and the Gordonstoun Quaich, the traditional 'Scottish cup of friendship'.